Five mantras of saving your baby’s soft skin !! Being a parent is just such an uphill battle !Hovering all day around your little one’s to eyeing him whole night if he is OK ,it’s tiresome and yet we do it with so much love and affection for out little cutie pies .On the one hand we try pulling our limits to meet their demands , on the other we are even worried as to what we do for them , is it good or bad for them . We tend to give our best to our kids , be it for in taking or proper caring or proper protection for that matter. But one thing that should be extremely taken care of is ,a baby’s skin .The skin being the most delicate yet essential part of a baby has a lot to do with his health and mood swings . For instance ,if the baby is feeling wet ,he tend to be the most irritated person around .If he is feeling some itching on the skin ,he may try to chew his nails of because if it or if the baby gets a rash ,then Oh my God !You just don’t need a loudspeaker to announce that your baby is suffering from skin rash .His cries are enough for that . To avoid the above problems and more ,let’s get these five mantras crustal clear in our routine for a cheerful baby and hence ,a satisfied mum . ● Choose the best kind of towels and clothes for your baby .The towels should be soft and not with those loose thread ends that tend to tie up in your baby’s little fingers or nails .Even their clothes ,chose them according to the seasons and climates and not to overdress them .This may make them feel uncomfortable and fidgety .I myself prefer my baby’s clothes of 100% cotton material for better protection against sweat and rashes . ●Choose your diapers with extreme care .Nowadays ,the pant style diapers that are available in market is really a great choice as they avoid the tape marks on the baby’s thighs and gives a comfortable easy feel to your babies .Apart from these , these diapers should be the one that are friendliest to the baby’s skin and dries of faster and even takes care of their softness with lesser chemicals used .Also , a regular diaper change is a vital part for a healthy baby skin . 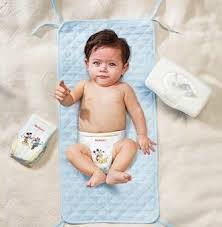 ●Don’t be too harsh while cleaning your babies on the times of changing their diapers .Always use mild baby wipes with less chemicals and fragrance used .Or even a tissue should be good if it’s soft .Dab ample amount of talcum powder before putting on diapers and after cleaning your babies .This helps them stay fresh and dry for long . ●Toys and cradles that babies use are also a part of their sanity .As the baby is in constant connection to them .Make sure you wash and clean their toys and give them to avoid germs getting in touch with the baby’s skin . ●keep the play area or mattress the baby stays on clean and don’t use harsh detergent on them. Most often , mothers trying to be extra careful about cleanliness on the baby’s part use harsh detergents to clean their mattresses, cots , shawls etc .that leads to itching on the baby’s skin .This is very harmful as it may leave permanent patches and marks and dryness on your baby’s skin .So , avoid using harsh detergents , instead soak them in warm water for long and then clean them with a mild detergent. These are some of the ways by which you can safeguard your baby’s skin softness for long .A little care and precautions from our side will certainly lead our babies to be more happy , more cheerfulness and comfortable and not to forget with the softest satisfied skin too !! Pampers brings you the softest ever Pampers Premium Care Pants. Its cotton-like softness is #SoftestForBabySkin and allows it to breathe, thus keeping baby’s skin soft and healthy, and your baby happy. Previous Post Five simple ways to keep your baby’s skin safe and softest ! !